Walk in the footsteps of dinosaurs – literally – at the oddly named Picketwire Canyon on the Comanche Grasslands south of La Junta. 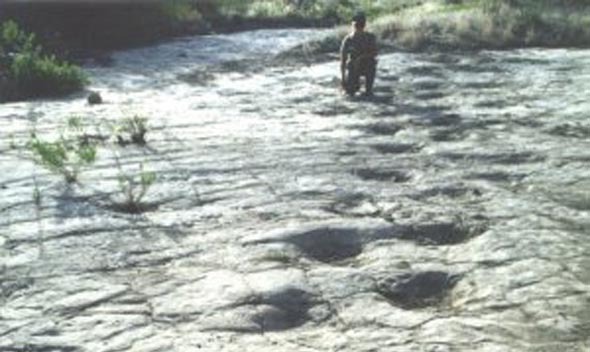 Picketwire, a garbled interpretation of the name of the Purgatoire River that runs through it, offers more than 1,300 dinosaur tracks preserved in stone, the largest set in North America. The tracks trace a 1/4-mile stretch through the Purgatoire Valley. They were pounded into the ancient mud surrounding the lake that filled this valley 150 million years ago by gigantic plant-eating dinosaurs and predator dinosaurs passed through the area. Partial skeletons of the Camarasaurus and Allosaurus have been discovered. The tracks of dinosaur youngsters weave around the larger tracks of their parents like those of playful children. The canyon also has Native American rock art, ruins of a mission and cemetery, early Hispanic settlements and a historic cattle ranch. Rock art images, left by nomadic people passing through in pursuit of game, are up to 4,500 years old. Eons after the dinosaurs moved on, Mexican pioneers moved into the valley and built the Dolores Mission and Cemetery, sometime between 1871 and 1889. Ruins of both are still visible. Further on is the Wineglass or Rourke Ranch, founded in 1871 by Eugene Rourke. Rourke’s descendants worked the ranch for 100 years, expanding the original 40 acres to 52,000 by the time it was sold in 1971. Picketwire is about 25 miles from La Junta on Highway 109 south to county Road 802 and south on County Road 25. A high-clearance vehicle can drive another three miles east on Forest Service Road 500A to a trailhead parking area. Access into Picketwire Canyon is by foot, non-motorized bicycle and horseback. Follow a hiker and a pair of bikers down the trail on YouTube. The mission and cemetery are 3.7 miles into the canyon, the dinosaur tracks are another 1.6 miles and the Rourke Ranch another 3.4 miles. Visitors with a four-wheel-drive vehicle may reserve a place on an auto tour guided by Forest Service rangers. There are three toilets at the parking area but there is no water for drinking in the canyon. It’s not an easy hike and visitors are encouraged to travel with others, to carry a first aid kit and a gallon of water per person and in summer to wear a hat, sunglasses, sunscreen and insect repellant. High-topped hiking boots and long jeans are recommended as cactus is abundant and you may encounter snakes, scorpions and centipedes. Tennis shoes are a good idea for crossing the river, which has unseen drop-offs.